Parenting books – love ’em or leave ’em. Most times, I leave them after perusing the table of contents. I don’t like the one-size-fits-all approach that so many of them take. 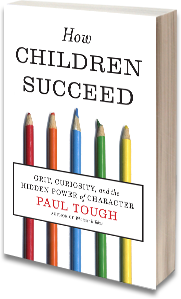 But Paul Tough’s excellent new book, “How Children Succeed: Grit, Curiosity and the Hidden Power of Character,” rises to the top of the parenting book pile for its deep exploration of failure and the ways in which it builds character in our kids. First a word about character. It’s as unique to each person as her DNA. Tough offers the revolutionary concept that character, unlike DNA, is not fixed or completely innate in a person. It is, in a word that recurs throughout “How Children Succeed,” malleable. I confess that I was initially very uncomfortable with the word malleable for its implication of weakness and undue influence. But read Tough’s book and you quickly learn that malleable is an asset. Tough presents living examples of low-income kids who have had the opportunity through mentoring programs, family members or discerning teachers to pause and look inward to shape and reshape their character. Kewauna Lerma was such a student. On the fast track to derailing her life, Kewauna did an about-face during her junior year of high school. She still lived at the poverty level on the South Side of Chicago, picking fights at school and struggling academically. But a spark was lighted inside of Kewauna through a mentoring program and encouragement from her mother and great-grandmother. There is no question that kids mired in poverty have it tougher than children of affluence. But Tough admirably teases apart the hazards of having it too good without falling into the “poor little rich kid” syndrome. For wisdom on the challenges faced by kids who seemingly have it all he turned to Dominic Randolph, headmaster of the tony Riverdale School in Riverdale, N.Y. – a well-off section of the Bronx. Randolph was initially the subject of a [start ital. ]New York Times Magazine[end ital. ]article that Tough wrote last fall. In that article, Tough explored Randolph’s claim that failure and character lead to academic success. I think that Tough is on to something big here. We talked about post-college choices that kids who have graduated competitive colleges have made. He asserts that ironically their fear of failure steers them toward investment banking and management consulting jobs. I wonder if our adult kids’ pervasive fear of failure hasn’t returned them to their childhood bedrooms, dissatisfied and unemployed. Yes, it’s a tough economy out there, but have we made them afraid to take chances, to bypass meaningful engagement and social justice opportunities? Which brings me back to where I started. Perhaps character is not destiny, that it’s malleable enough to forge the kind of future that can fulfill our kids. This entry was posted in books, College, culture, Current Events, education, Parenting, parenting, Teens by judy bolton-fasman. Bookmark the permalink. Great piece Judy. And I love that the author’s name is Tough. Tough love, letting them fail.